When I hear/read the word "kachori", all my life spent in Jaipur flashes before my eyes where we used to eat them at least once a month, sometimes more. We used to get it from the local sweet shops on Sundays, accompanied with Jalebis, Samosas etc. So when I moved out of India, I used to drool thinking of this savoury dish; and I so wanted to have it that I decided to make it for myself. So I set upon looking for recipes, and all of them involved maida (all purpose flour), and as my mother is a naturopathy medical professional, I was a little disappointed to look at those unhealthy recipes.. Because you don't realize what you are eating when it's enjoyable to eat with family, and it is brought from the market; but making something unhealthy in your own kitchen is a totally different story. So I thought why not replace the maida with the regular atta (whole wheat flour which we use to make chappatis) and try to experiment. 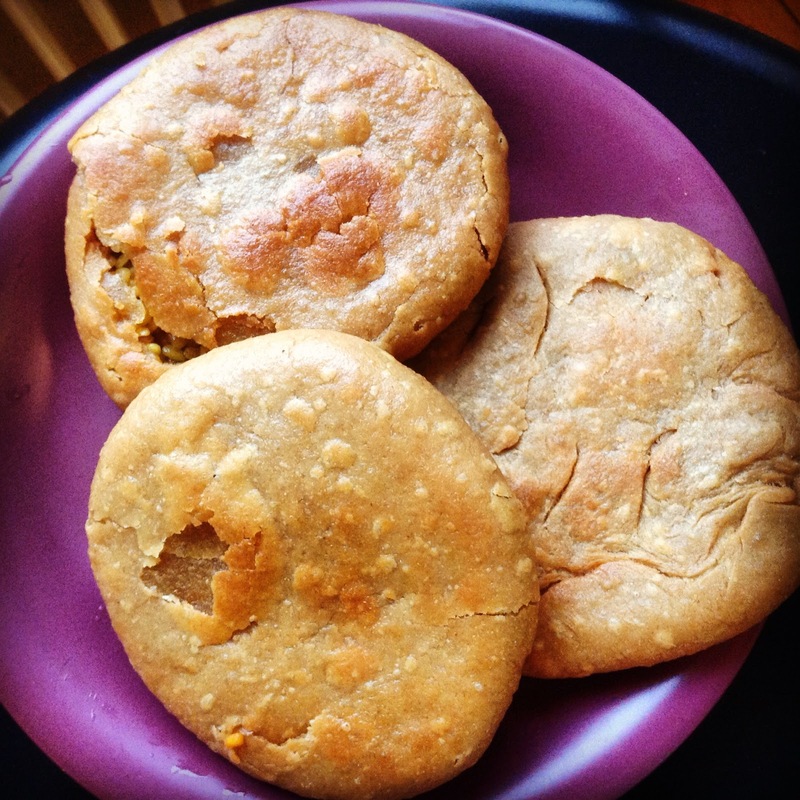 It would be a healthier version of kachoris if it is a success. I was a little hopeful as I had already tried the healthy version of Whole wheat samosas. So I prepared the dough for only three (for me and my husband) as it was an experiment.. And I simply could not believe it how amazing and yummy they turned out to be !!! They were an instant hit and we finished all three so quickly that I doubted if I ever made them in the first place..
Now, the biggest point is here.. when we eat kachoris from the market, one is more than enough for a normal person and we feel full. But I must say that these were so light, although they tasted a bit different, that we did not feel full even after having 1.5 kachori each; so I had to make extra idlis to fill up ourselves on that Sunday morning..
Find my recipe in here..
Btw they look lovely ! !